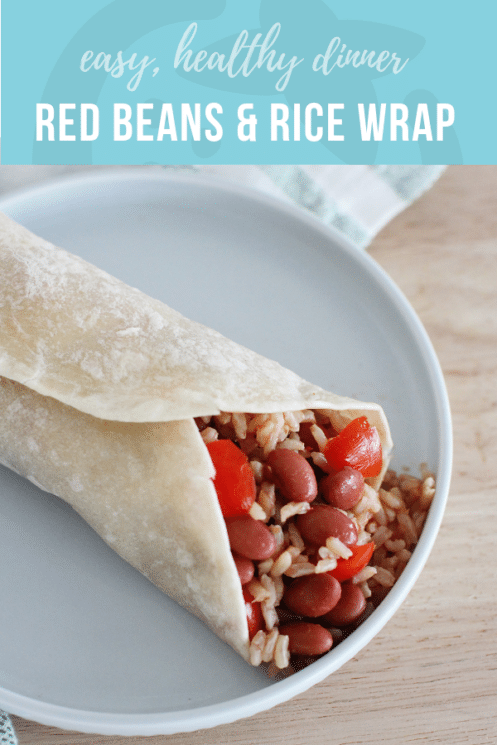 Bundle up these gently-seasoned red beans and rice in a whole grain wrap for an easy dinner that’s kid-friendly, handheld, and plant-based, too. When you think of classic red beans and rice, you probably think of the long-simmered Louisiana dish full of Cajun spices and bits of meat. Delicious and nutritious? Absolutely. Beloved by picky children? Maybe not. Suitable for busy parents to whip up on for a weeknight dinner? That’s a hard no. We’ve redesigned the red beans and rice concept to be fast and easy to make, and appealing to kids who like to be able to pick up and hold their food. Add it to your Meatless Monday meal plan this week. 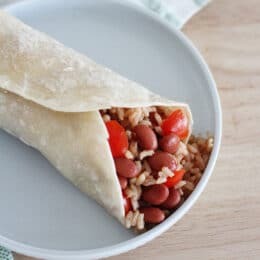 This wrapped version of red beans and rice has more of a southwestern flavor profile than a Cajun one, mildly spiced with cumin and salsa to match the burrito wrapping. Beans are a plant-based powerhouse of nutrition. If your kids eat just four tablespoons of red beans, they’ll get a whopping 12 grams of fiber. That’s fully half the daily recommended amount for a school-aged kiddo! Beans are high in protein, and linked to longer lifespans, too. Bring on the beans! Another thing you should know about this meal: it’s low in fat. This might be desirable to you, or not. 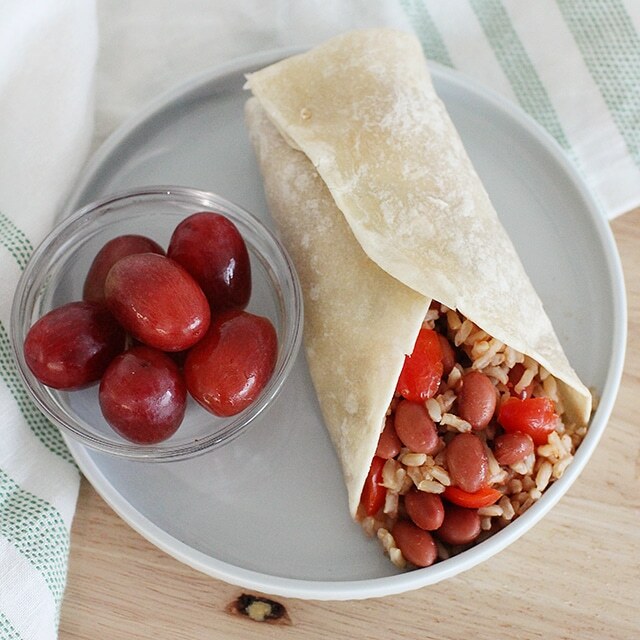 If you’re feeding growing kids, feel free to sprinkle some shredded cheese inside the burrito wrap for extra calories. Slip a side of fruit onto their plate and you’ve served a balanced meal you can be proud of. Go you! You can prep this meal early and get a strong head start on dinner. In fact, cooking and cooling the rice ahead of time helps the starches congeal a bit, so the grains don’t clump together too much. 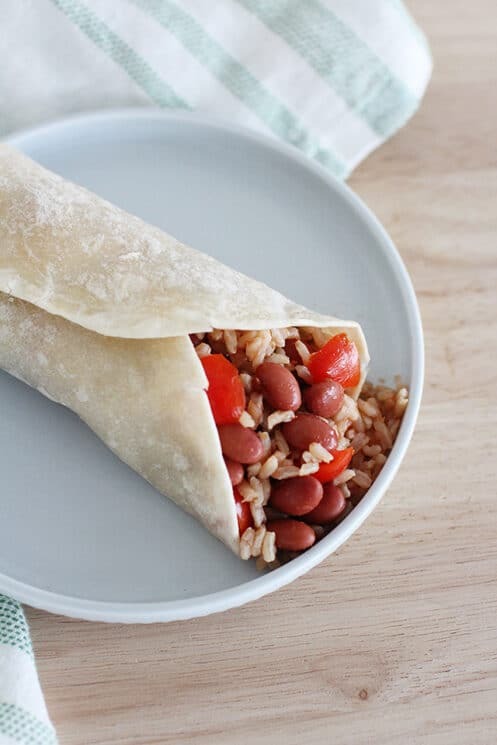 Try prepping the filling ahead by mixing the beans, rice, salsa, spices, and tomatoes in a bowl, then refrigerating. When it’s time for dinner, reheat the filling, warm the tortillas, and you’ll have dinner on the table in five minutes flat. Here’s another make-ahead option for this recipe: batch prep and freeze it! You may find that adding a bit of gooey cheese inside helps everything stick together before freezing. Roll up each wrap inside a piece of parchment paper and a piece of aluminum foil, then place them all in a gallon-sized freezer bag. Make-ahead mavens, we have a lot more ideas for meals you can batch prep here and here. Cook the brown rice according to the package instructions. Drain and rinse beans. Gently stir in the beans, salsa, cumin, and garlic powder into the warm, cooked rice. Add in salt, pepper and juice of lime. Warm tortillas and fill each with beans and rice. Serve topped with chopped tomatoes. Love the burrito idea! The crockpot looks awesome. I have a teeny one, which isn’t always useful with my family of five! Okay, it seems like I am always commenting when you have a giveaway and I don’t mean to seem greedy- so you can take me out of the contest- but i would *love* to have the recipe for the rice/beans in the crockpot!!! With summer here, I try to use my crockpot more often and that actually sounds pretty yummy!! Thanks! I love your blog and am looking forward to some healthy ways to feed my children. Keep up the good work!!! BTW I would love that crock pot to feed my family of six! I do, I do, I do! I love crock pots! And, I’ve been wanting a bigger one, and one with a timer. The cook book looks great, too. I love putting in an easy meal in the morning and having it all ready in the busier evening! I have been wanting to try some crockpot meals for some time now. I think it would make more time available in our household! Would love the recipe for the beans & rice! We’re quickly growing out of our crockpot so a bigger one would be a dream! I’m with the other gals, too–will you please post the recipe? I always need a good recipe to use my beans. Thanks! I often see recipes and pictures on blog for red beans and rice but I’ve never had it or made it myself. I’ll have to give it a try. And thanks for the idea! I think my son would be more apt to eat it in a tortilla too. I find I sometimes have to get inventive with presentation. Sautee in pan a chopped onion,chopped green pepper, and a garlic clove. 2 tsps chili powder to vegetables. 1 can (14.5 oz) diced tomatoes with the juice. Put in slow cooker for 6-8 hours. Serve over rice. My husband dented mine(dropped it) so I’d love a great one! Thanks for all your great ideas! Honestly, they looked good to me in the first picture, but yes, even better wrapped in a tortilla with cheese. Crock pots are so handy! I’ve been trying to find a great rice and beans recipe. I’m so excited to try it, and I would love a new crock pot. I have used mine so much it’s not working the best. Thanks for a great site- love so many of these recipes. I love all your great ideas and inspiration and would LOVE a new crock pot. Mine is from the early 90s…….I’ve been wanting to replace it for a while now. I would love a new crockpot! I should use it more, but I claim I don’t know what to make. 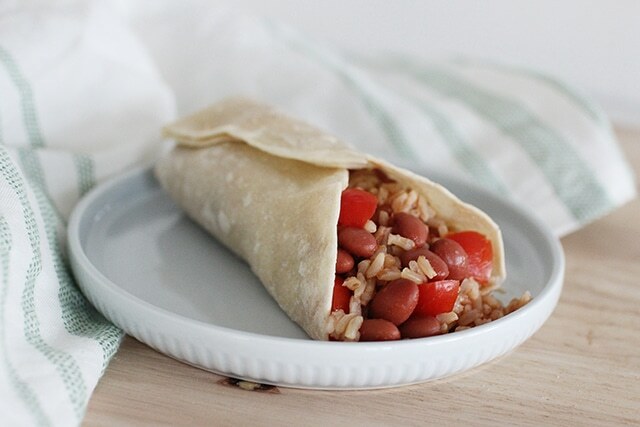 The rice and beans looked yummy wrapped in a tortilla. I need a new crock-pot. I’ve had the same one since I got married (20years) so mine is getting a little sad. Here is an idea. When most people get home from the grocery store they put their meat in the freezer. Try just throwing it in the crock pot, when its cooked, cut it up and then freeze it. It is so much easier to warm up cooked meat and throw it in a meal (like on a salad, soup, burritos) then to have to thaw it, then cook it, then cut it up. The crock pot is great and can make meal time so much less stressful. Our church group just had a whole night all about easy crock pot ideas and we sampled 5 desserts made in the crock pot too. It was great! I agree with the previous comment – the beans and rice looked good in the first picture as well! I think I might have to try that recipe. Oh yeah, and I’d LOVE to win a crockpot. I’m a huge fan of crockpots, and after having my 5th child (almost 3 weeks ago) I appreciate the crockpot all the more! I love using the crock pot for easy meals. I would love a new crock pot to try all the recipes in the cookbook. Oh how I NEED a new crock=pot! Love the burrito idea and mine would need advocado’s on it too! Thanks for all your helpful tips! I need a new, bigger & better crockpot!!! When we moved to CA my large crock pot went missing. It was so sad. All I have is my old small one that just won’t cut it making dinner for 4. Thanks for the giveaway! Wow, Amy! This is your best giveaway ever! Count me in! i looove my crockpot. I am currently drooling over the smell of roast that i put in for dinner. I love using crockpots during the summer! Our schedule is usually a little more varied when it’s nice out, so it’s great knowing dinner is already finished and we can be more flexible with when we eat dinner. The crockpot and recipe book look awesome. So does your meal. Thanks for sharing the recipe. That is a wonderful quick change with the beans and rice. Good call! I would love a crock pot, so please sign me up. Free crockpot?! Count me in. I would love to win a new crockpot to try some new recipes that doesn’t heat up my house during the hot summer. I love your blog. Thanks for all the great ideas! I was just asking my moms advice on price and health differences with fresh squeezed and store bought. Store bought is easier which I am all about these days but I don’t need all the extra sugars since we use OJ just for our smoothies. I will print the coupon and give the less sugar a whirl, thanks. 🙂 Oh and a win would be nice too. Awesome giveaway! Count me in! I love your blog and the way that you are teaching healthy eating to your family! What a great example and inspiration you are… I would love a crockpot! That looks a lot like a meal we have for breakfast sometimes, except I’m sure it’s less healthy- Pork n Beans, rice, and an over easy egg. True, I was skeptical to try it the 1st time, but I’ve actually been craving it as of late! Even for a non-bean lover like myself (and it’s the taste, not the texture that does me in), that recipe looks great – especially with a little avocado thrown in! We use our crockpot at least once a week. Ours was a wedding present – 15 years ago. I would love a new one! I could use another crockpot. We got ours when we were married. Now, we are a family of 6 and it is a bit old and small! I love it when you post new recipes too! Hope I win. A new crockpot? What would I give for a new crockpot!!! Great giveaway! If I won the crockpot, I’d give it to my daughter who just graduated from college May 9th and is starting out on her own. She has a job (yea!) and loves to cook. She also has lost 56 pounds since Jan.1 – so I want to help make it easy for her to have healthy food ready when she walks in from work and not be tempted to eat junk because she’s hungry! I just love cookbooks! I collect them and I love all different kinds! I would love a new cookbook and the crockpot would be nice too! I’m always looking for fast ways to cook a good meal! I love crock pot meals! they are so simple and fast, which reminds me to go make my crock pot meal for dinner tonight. I think the rice and beans looks good! Would love to win this for my daughter’s hope chest. Thanks for the chance! Ooh! Now I’m craving beans and rice! Yum. Thanks for the opportunity to win a crockpot! Awesome prize. Hi, this is kusuma. Rice and lentils are daily part of our menu. we generally use pressure cooker. Crockpot is new to me. looks interesting. Today I made your sloppy lentils in MY crockpot. They were great. I don’t use my crockpot enough. Keep the recipes coming, they sure make dinner easy. Everything tastes better coming out of a crockpot. Thanks for all the great giveaways and the inside scoop on new ideas for our kids and ourselves. I’d love a crockpot!! Thanks for this great opportunity! We would love to try some new recipes. We use our crockpot a lot, even though it’s seen better days! Would love to update, but with a family of seven, there’s always something else that comes first. My crock pot has seen better days and I would love to have a new one! I would love a new crockpot!!! Thanks for the great website – I love reading your feeds in my google reader! Thanks for all of the great ideas! I broke the lid on my OLD NEW pot and would love a new one to get me cooking again! I could really use a second crockpot and some new crockpot recipes. I love the convenience of my crockpot both at home and while camping. Thanks for this website and all the inspiration you bring to mealtime at our house! I really need a crockpot. I’m in . . . Thanks Amy! I have been wanting a crockpot for a long time. I’d like to make yogurt and refried beans in it. Oh my goodness! Are you serious? I would LOVE both of these! Wow! I love crockpots! Your idea of working with the kids and putting the filling in a tortilla is excellent! Also when kids get a chance to put ingredients in the crockpot or bowl (or whatever you are using) to help make the meal they are more prone to wanting to eat what the helped prepare. Ooh, could I ever use a new crockpot. My high setting burns food and my low setting takes 12 hours to cook the simplest dish! I’m pretty sure the CrockPot has replaced my best friend as the executor of my will. It’s so much more practical. Crock pots are a wonderful invention! Thanks for a great giveaway and an ever interesting blog with lots of good ideas. It’s one of my faves cause we seem to approach eating and feeding our families similarly. I like the way you think! I love to experiment with crockpot cooking. I think one of my most favorite inventions are the crockpot liners. They make clean up super easy. Easy cooking and clean up who could ask for anything better! I look forward to reading your blog everyday. You always have such great ideas. Thanks! We love crock pot cooking and cannot do it anymore since the lid broke. It would be great to win a new one so we can get cooking again!! I have been crockpotting more and more because it saves so much time. Plus, it’s easy and easy to clean up. I would love one of these! THanks. Oh, pick me!! I desperately want a new crockpot–aren’t slow cookers the best invention ever?! Ooooh a nice new crockpot would be fabulous….mine is currently being held together with some weird bonding glue….duct tape just wouldn’t work on this particular crack:) Thanks for all of your posts. I check your blog daily and love your ideas. I cook with crockpots several days a week, and I desperately need a new one. THANKS! Oh, I would so love a new crock pot! I really enjoy your site. Lots of great ideas! I absolutely love your blog! I have always wanted a crock pot, but fund are tight here and we have never gotten around to being able to get one! I would love, love, love to win this! Thank you so much for blogging and sharing all of your healthy ideas with all of us!! OH…pick me! Pick me!! Love that crock pot! Looks like it will fit everything my current crock pot won’t. 🙂 Thanks for all the great ideas to feed my kiddo’s! I don’t think my crock pot is very old but it is showing signs of wear and tear. I’d love a fancy looking replacement! I love beans & rice! The crockpot looks awesome, I’d love a new one! This recipe looks great. Can’t wait to try it. Thanks to your website/blog I am dedicating lots of time this summer with my boys to cooking, shopping, meal planning and of course, incorporating simple, whole, healthy ingredients. And although I hadn’t thought of crock pot cooking in the summer before it makes perfect sense, no oven to heat up the house and meals that can be ready to go when we are on the go! Thank You Thank You Thank You! I found your site recently and love the great recipes and ideas you share. Thanks! Oh, and I would love a crockpot! What great ideas! I love the way you use a crock pot with meals for kids. It sure makes delicious meals simpler. Hopefully I am not too late for the giveaway, but if I am, oh well. I really need a new Crock Pot. Mine has definitely seen better days. The knob is gone, the bottom is melted. Hrmm…..
Do you have the recipe for the beans and rice? Looks good, is this ok for someone with weak digestion u think? Yes- I think it would be great, but I don’t have that recipe anymore!! Thanks for letting me know about the error. it was an old video that wasn’t active anymore. I deleted everything that pointed to it. ah, too bad….can you point me to any other recipes on your site that might be good for a weak stomach? It would all depend on what makes your stomach queasy. It’s different for everyone. Have you tried an elimination diet to see what you are sensitive to? No, I haven’t. Can you point me in the right direction? Are there recipes on your site I can use as part of this process? I think my husband and kids would actually eat this. Normally he turns his nose up at “Crock Pot” food.